The GIs in Tunisia's Kasserine Pass were in trouble. Their equipment was outdated, their leadership was weak, and Desert Fox Erwin Rommel was aiming his army straight at them. US Major General Lloyd Fredendall had never seen Sidi bou Zid, the patch of North African desert where his forces were about to clash with those of German Field Marshal Erwin Rommel on February 14, 1943. Fredendall was 80 miles away, plotting his battle tactics on a map. If he had been on the scene, he might have realized that the hills on which he was perching his infantry regiments were too far apart for those units to support each other or the tanks on the flat ground below them. Rommel realized it, though. In the impending clash at Sidi bou Zid and in the ensuing larger fight five days later at Kasserine Pass, he would make no mistake in demonstrating to Fredendall why he was known as the Desert Fox. Years before these forces met—indeed, years before Germany declared war on the United States—the outcome of the battles at Sidi bou Zid and Kasserine Pass had already been determined. Since the end of World War I, the United States had turned its back on its armed forces, particularly the army. While Germany developed state-of-the-art tanks and theory for using them in battle, the US Army did next to nothing of the sort. Americans by and large were in no frame of mind to have their tax money spent on the military when they had no intention of fighting a European war ever again. By the time Germany invaded Poland on September 1, 1939, the United States had only the 17th largest army in the world, with about 190,000 troops. Worse, the US Army was one of the least modernized forces in the world. Army training had ground to a virtual halt in 1934. Army doctrine was mired in World War I thinking, and the materiel was of the same vintage. The army had little or no experience maneuvering or operating at brigade, division, or corps levels. It was scattered all over the United States and its territories, mostly at battalion strength. So, when US Army units finally met the Germans on the North African sand in February 1943, they would do so with weapons and tactics inferior to those of their battle-hardened enemy. The US Army’s main medium battle tank (classified by relative weight) was the M4 Sherman. The Sherman’s main gun was a 70mm cannon, which gave it at least a fighting chance against the German Mark IV tank. On the other hand, the gasoline-burning Sherman tended to catch fire when hit by an enemy shell, hence its rueful nickname among American troops: the Ronson, after a company that manufactured cigarette lighters. The Americans lagged behind the Germans in other equipment, too. The US antitank gun was a towed 37mm weapon that proved to be of little use against medium and main battle tanks, and many US soldiers still carried the same bolt-action Model 1903 Springfield rifle that their daddies had shouldered in the First World War. The self-propelled, armored tank destroyers were an improvement, however, and the battles of Sidi bou Zid and the Kasserine Pass would see the introduction of the bazooka antitank rocket launcher. Another infantry weapon, the M1 Garand semiautomatic rifle that was issued to some units, would prove clearly superior to the bolt-action K98k Mauser carbines used by German foot soldiers. Before the November 1942 Allied invasion dubbed Operation Torch, the story of warfare in the North African desert was that of the conflict between Rommel’s German-Italian Panzer Army and the British Eighth Army commanded by Field Marshall Bernard Law Montgomery. Rommel’s offensive against the British stalled and then was turned back by Montgomery at El Alamein, just west of Alexandria, Egypt. Over the following months, Montgomery’s Eighth Army shoved its Axis opponents along the entire length of the Libyan coast until Rommel’s army took shelter behind prepared defenses near the Tunisian coastal town of Mareth. As Rommel held the Mareth Line, an army commanded by Colonel General of Cavalry Hans-Jürgen von Arnim denied northern Tunisia and the important port city of Tunis to the oncoming Allies. Before the Kasserine battles began, the Allied army in Tunisia occupied an enviable position. There were two principal Axis forces in the country: Rommel’s in the south-central part and von Arnim’s army in the north and center. The line stretching between those two forces was rather weak, and a thrust from the Allied center could pierce its way to Sfax on the coastline and separate them. From the northern portion of the country heading south, British, French, and American forces manned the Allied line. The best component of the Allied army was undoubtedly the British, under Lieutenant General Kenneth A.N. Anderson. The center of the line was former Vichy French troops who fought well but who were badly equipped and supplied. 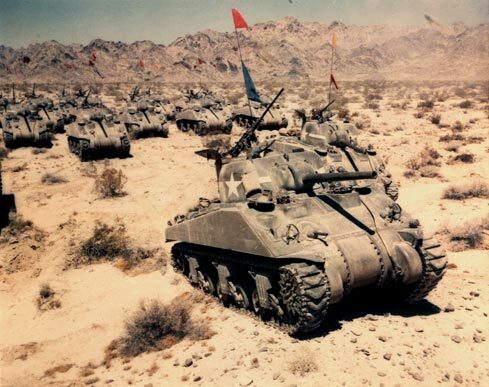 The American force was the II Corps, spearheaded by the 1st Armored Division. In charge of the Americans and operating semi-autonomously from Anderson’s command was Fredendall. He chose to command his corps from Tebessa, some 80 miles to the rear of his forward units. Although the Americans had traveled with Anderson’s army across Algeria to take up positions along the line of Tunisia’s Eastern Dorsal Mountains, they had not yet had a major encounter with the enemy they called “the first team,” the Germans. But because the Allied line threatened the rear of the Mareth Line, Rommel was preparing a welcome for them. So was von Arnim, whose left flank was also threatened by the Allies. It was von Arnim who would strike first, attacking the center of the Allied line and taking Faïd Pass from its French defenders on January 30, 1943. Nearby American forces failed to come to the aid of the French, and the British and French were not impressed with their New World allies. In response to the German capture of the pass, Combat Command A (CCA) of the US 1st Armored Division took up defensive positions around nearby Sidi bou Zid. And so matters rested for about a week. Technically, all Axis operations in North Africa were the responsibility of the Italian Commando Supremo, meaning Benito Mussolini’s top generals. German Field Marshal Albert Kesselring commanded the African theatre for all intents and purposes, but even he had to clear operations with the Commando Supremo. On February 11, von Arnim and Rommel were finally ordered to take the offensive and crush the Americans at the southern end of the Allied line in Tunisia. This would negate the possibility of an American lunge at the German-Italian Panzer Army behind the Mareth Line. It was von Arnim who would act first, launching a Valentine’s Day surprise for CCA at Sidi bou Zid on February 14. He attacked with two panzer divisions, the 10th and 21st. The attack force included 200 Mark III and Mark IV medium tanks and at least a dozen heavy Tiger tanks. The American defenders were perched on hilltops, with the 168th Infantry’s 2nd Battalion atop Djebel Lessouda (djebel means hill), and its 3rd Battalion across the valley on Djebel Ksiara, and three tank companies—G, H, and I of the 1st Armored Regiment’s 3rd Battalion—on the floor of the valley between the hills. Fredendall dictated these emplacements from his distant headquarters, bypassing the CCA and 1st Armored Division commands and without having seen the ground. If he had seen the battlefield, he might have noted that Djebel Lessouda and Djebel Ksiara were so distant from each other that the forces perched on them could not effectively support one other or the defenses on the valley floor. Each of these pockets of infantry and tanks was essentially on its own, ready to be defeated in detail. 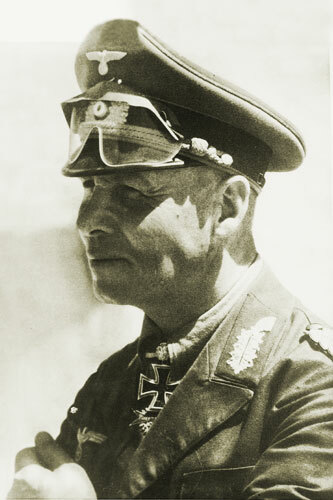 Under the overall command of General Heinz Ziegler, the Germans attacked out of Faïd Pass with the 10th Panzer Division advancing under the cover of a sandstorm. The German force divided, with one battle group of the 10th Panzer swinging around to the north of Djebel Lessouda, partially surrounding the 900 soldiers of the 168th Infantry’s 2nd Battalion and cutting them off from possible artillery support from the rear. The other prong of the 10th Panzer’s attack met tank Company G of the 1st Armored’s 3rd Battalion head-on in the valley. It overwhelmed the American armor. US Colonel Louis V. Hightower sent in tank companies H and I—about three dozen Shermans—to delay the 10th Panzer’s advance. The move worked, but at a cost. German 88mm antitank guns at the base of Djebel Lessouda and tank artillery did horrendous damage to the Shermans. Hightower’s attack was turned back, and the effort to escape the ambush was mostly foiled by the enemy fire. US Colonel John Waters, commanding the 168th Infantry’s 2nd Battalion isolated atop Djebel Lessouda, could only watch the fight without being able to influence it. Waters would be captured on the slopes of his mountain stronghold. Meanwhile, elements of the 21st Panzer hit the 168th Infantry’s 3rd Battalion stronghold on Djebel Ksiara to the south of the valley. The attack was successful, forcing Colonel Thomas Drake and the 1,900 men of his 3rd Battalion to request permission to retreat. The response from Fredendall was to hold the heights. He was moving reinforcements in the direction of the battle and evidently expected his outposts around Sidi bou Zid to hold out until the help arrived. Holding out was out of the question for Drake, but he was able to move part of his force a short distance west of his original position, to the more defendable heights of Djebel Garet Hadid. The rest of his men remained isolated atop Djebel Ksiara. Meanwhile, the elements of the 21st Panzer Division that were not attacking Drake were on the move, circling from the south miles to the west of Drake’s outpost and coming up on Sidi bou Zid from the west. By the end of the day, they met up with elements of the 10th Panzer and took up positions just west of the town of Sidi bou Zid. Sidi bou Zid was in the bag in a double envelopment. 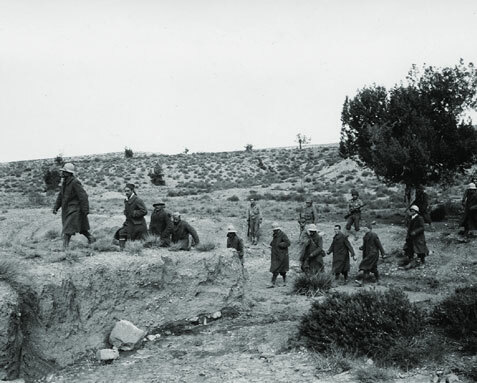 On February 15, the Americans launched an armored counterattack down the Sbeïtla road against the Germans in the valley around Sidi bou Zid. The attack force, commanded by Lieutenant Colonel James Alger, consisted of the 1st Armored Infantry’s 2nd Battalion, followed by the 6th Armored Infantry’s 1st Battalion. Into the valley they drove—some 13 miles—without making an attempt at reconnaissance, and taking a pounding all the while from Stuka dive-bombers. Alger’s force was ambushed on both flanks by elements of the 10th and 21st Panzer divisions, and his lead battalion was destroyed in the afternoon battle. The enemy took 58 officers, 298 men, and 50 Sherman tanks out of action, and Alger himself was captured. Only the 6th Armored Infantry’s 1st Battalion managed to free itself and retreat back up the road to the town of Sbeïtla in the Western Dorsal Mountains. At the close of the 15th, the battle situation for the 168th Infantry’s 2nd Battalion atop Djebel Lessouda and its 3rd Battalion under Drake was dire, to say the least. Both commands received airdropped orders to extricate themselves and both made the attempt. A few hundred men of the two widely separated battalions made it safely through the German lines. The rest, including Drake, wound up as prisoners of war. The battle destroyed the 168th, which had been created from companies of the Iowa National Guard, men who never expected to be squandered in the Tunisian desert. CCA was for the most part wrecked by the battle at Sidi bou Zid. It lost just short of 100 tanks, 57 halftracks, and 29 pieces of artillery. The survivors took up positions around Sbeïtla and were joined by Combat Command B (CCB) of the 1st Armored Division. The Germans were not far behind the remnants of CCA and soon had Sbeïtla under machine gun and artillery fire. At this point, CCA commander Brigadier General Raymond McQuillin made a costly decision to move his headquarters west of town, where it would not be under such direct threat. CCA survivors misread this move as the signal for a general retreat and made haste to leave Sbeïtla. CCA was no longer an effective combat force. Only scattered units remained in the vicinity of the town to assist CCB in defending the area. The Germans had very little difficulty ascertaining American intentions. They knew from monitoring the panicky and voluminous Allied radio traffic—much of it uncoded—that Sbeïtla was not going to be held with any tenacity and that Von Arnim could continue his offensive without fear of a firm response. The Americans also abandoned the town of Gafsa in Rommel’s front, opening the road to the Kasserine Pass, where the Americans were evidently going to make another stand. On the way to Kasserine, Rommel captured 50 tons of fuel and lubricants that the Americans had failed to destroy. But even though he was pleased with his spoils, he was looking farther up the road, past Kasserine toward Tebessa, where the US II Corps was headquartered and where there were enormous dumps of fuel and supplies. If he captured Tebessa, his advance could swing all the way to the city of Bône on the Algerian coast, cutting off the British—who were advancing on Tunis—from their supplies in Algeria. Kasserine Pass was the key to making these triumphs real. Von Arnim wanted to follow up his victory at Sidi bou Zid with a swing in a more northerly direction to bag more British and Americans. Kesselring decided to split the difference and have Rommel launch the offensive he wanted, but to aim it not at Tebessa but at the city of Le Kef further north, about midway between Rommel’s and Von Arnim’s respective objectives. Rommel was initially unsatisfied with this decision, but being the warrior he was, he quickly regained his customary enthusiasm for the offensive. He planned a decisive thrust at the Americans at Kasserine Pass. The pass itself lay north of the village of Kasserine and was flanked on either side by tall hills, Djebel Semmama to the east and Djebel Chambi to the west. The two hills were not defended effectively by the American forces that moved in to protect the pass, which meant the Germans could seize the heights and then direct a plunging fire on the valley floor. The Hatab River, which divided the pass and was in full wintertime flood, bisected the American line. The Americans were astride Highway 17, which led to Thala, about 30 miles north of Kasserine, and was one of the enemy objectives. Another road, Highway 13, cut through the western portion of the American line. The main line of American resistance running east to west on the valley floor was not impressively manned. It consisted of the 28th Infantry Regiment’s 1st Battalion and the 39th Infantry Regiment’s 3rd Battalion, both from the 1st Infantry Division, and the 19th Engineer Regiment, whose 1,900 engineers were in no way prepared for the battle they were now called upon to fight as infantry. Few of the engineers had even completed rifle training, and their heavy equipment included only a non-lethal fleet of dump trucks and six air compressors. On February 19, 1943, two German battle groups probed the American line. Kampfgruppe Deutsches Afrika Korps (the German Afrika Corps Battle Group), including elements of the Italian Centuaro Division, approached that morning from the west and, after skirmishing there, crossed the front of the American line, dismounted from their trucks in the foothills of Djebel Semmama, and prepared for the assault. In the afternoon the second battle group, from the 10th Panzer Division, arrived from the east and launched the attack on the American line. By early evening, the 19th Engineer Regiment, defending Highway 17, was being infiltrated by groups of enemy infantry. A new German weapon, the Nebelwerfer six-barreled rocket mortar (soon to be nicknamed “Screaming Meemie” by the Americans), was hitting the engineers and the tanks and tank destroyers supporting the American line. Under fierce artillery bombardment, the line gave way during the night, with men at all points running away from the bombardment. The roads leading out of the north of the pass and the foothills on either side were beginning to fill with fleeing American soldiers. Rommel was determined that he would break through decisively the next day. He was not to be disappointed. The 10th Panzer group went through the eastern part of the American line, which was backed up by the Gore Force, a small unit created from the British 26th Armoured Brigade and the 3rd Battalion of the 6th Armored Infantry of the US 1st Armored Division, occupying positions on Highway 17. The 10th Panzer group met the Gore Force and overwhelmed it after stubborn fighting. The Gore Force’s bequest to the Allies was time to establish a second line of defense further north. Axis forces also made a breakthrough on Highway 13, where the Italians of the Centauro Division spearheaded the attack. 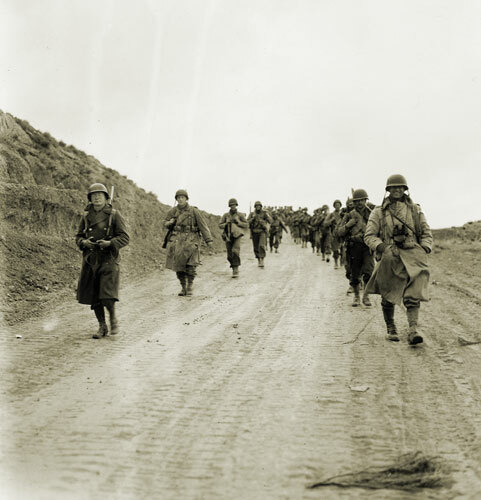 In the early morning hours, the Italians pressed their offensive, broke through the remains of the American line, and continued up Highway 13. At the same time, the 10th Panzer Division continued up Highway 17 to Thala. But new lines of resistance were beginning to take shape on the Allied side. British units, including the 2nd Battalion of the 5th Leicesters, 6th Armoured Division, deployed in front of Thala to meet the 10th Panzer’s attack. Converging on Thala was a substantial British force that included more 6th Armoured units and was backed up by a massive presence of US guns, including the artillery of the 9th Infantry Division—three full battalions and a company of cannon. With the main line of resistance at the southern end of Kasserine Pass broached, alarm bells were ringing at every level of the Allied command. General Dwight D. Eisenhower, the supreme commander of the Operation Torch invasion forces, felt that additional leadership talent was needed in the II Corps area and chose Major General Ernest Harmon, an aggressive and competent officer, for the job. Harmon was hustled forward, reportedly with orders to relieve either Fredendall or Orlando Ward, the 1st Armored Division commander, if Harmon felt that was necessary. Harmon would wind up in Thala, where he would make a crucial and arguably battle-winning decision. Meanwhile, the situation for the Allies was still very disheartening. Far in the rear, at Tebessa, preparations were being made to shift Fredendall’s headquarters out of harm’s way and to destroy the dumps of fuel, ammunition, and supplies in the nearby Speedy Valley base area. Morale was slipping badly, including that of Fredendall himself. Harmon reached Tebessa and met Fredendall, who asked if the command post should be moved. Harmon said it should stay where it was. Fredendall then handed Harmon a typed sheet that assigned Harmon command of the 1st Infantry Division and the British 6th Armoured, the latter of which Fredendall did not control. Fredendall continued to delegate authority. He placed Colonel Paul Robinett’s CCB under the command of British Brigadier General Charles Dunphie. Dunphie now had charge of two outfits: CCB and his own brigade, the 26th Armoured, which was positioned on Highway 17, on the other side of a broad valley from CCB. The command structure of the US II Corps was a tangled mess. Despite the disorder, a second line of defense was taking shape. On the western side of the valley, CCB was blocking the road to Tebessa. Elements of the Centauro Division hit a CCB outpost early on the morning of February 21, and after a brisk fight, the outpost withdrew. The Afrika Korps group continued up Highway 13. The CCB defenders held firm that long day against repeated Afrika Korps attacks. That night Panzergrenadier Regi-ment Afrika (Afrika Korps motorized infantry) tried to flank CCB to the south, but in the darkness it ascended the wrong hill. Luck was beginning to swing toward the Americans. British defenders on the east side of the valley were stalling the 10th Panzer’s drive on Thala. True, the Germans pushed Dunphie’s 26th Armoured Brigade out of two successive positions, but the British were making a good fight of it and taking some of the steam out of Rommel’s offensive. The Germans tried a ruse to break Dunphie’s brigade at its third line of resistance, outside Thala. German tank troops driving captured British Valentine tanks were let through Dunphie’s lines and launched a surprise attack that broke up resistance and caused the brigade to fall back on the last line before Thala. The next day, February 22, found the Germans pushing against two stubborn lines of Allied defense. The Afrika Korps group spent the day pounding away at CCB, which was defending the road to Tebessa. But the group had been somewhat dispersed by the previous day’s maneuvers and could not pry the defenders out of their positions. On the other side of the battlefield, Harmon was in Thala witnessing the stubborn resistance of the British against the pressing 10th Panzer group. Commanding the British “Nickforce” was Brigadier General Cameron Nicholson, an effective combat leader who kept his remaining forces steady under the German pressure. When the 9th US Infantry Division’s artillery arrived in Thala after a four-day, 800-mile march, it seemed like a godsend to Harmon. But the artillerists were greeted by orders from Anderson to abandon Thala and head for the village of Le Kef, 50 miles away, to defend against an expected German attack. Nicholson pleaded with the American artillery commander, Brigadier General S. Leroy Irwin, to ignore Anderson’s order and stay. Finally, Harmon commanded, “Irwin, you stay right here.” The artillery did stay, and rained a hail of fire—in fact, a whole peacetime year’s allotment of shells—on the advancing Germans, stopping them in their tracks. On the afternoon of the 22nd, the 10th Panzer group was ordered to withdraw, but the American and British fire was so fierce that the order could not be obeyed until after dark. On the western side of the battlefield, the attacks against CCB ceased, and in the afternoon, the Afrika Korps group began a withdrawal of its own. Rommel had witnessed the fury of the American artillery and was deflated. His zest for the attack was gone and thoughts of the Mareth Line and dealing with Montgomery began to occupy his mind. Rommel had also launched an attack with the 21st Panzer group up Highway 71, east of the Kasserine battlefield, but it had stalled. He concluded that there would be no march on Le Kef, much less Tebessa or Bône. He gave orders to withdraw. About 30,000 Americans had fought in the battles in and around the Kasserine Pass. About 300 were killed, 3,000 wounded, and 3,000 captured or missing. 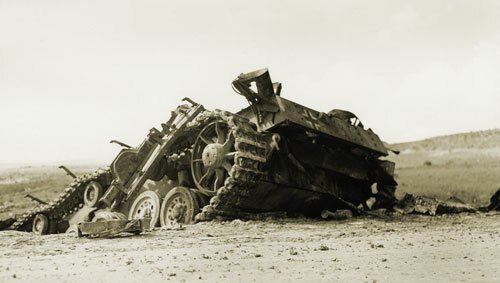 The II Corps had lost 183 tanks, 208 artillery pieces, 104 half-tracks, and 512 other vehicles, mostly trucks and jeeps. Italian and German forces numbering about 22,000 men had inflicted these losses. They were numerically inferior, but much more experienced than the green Americans. Sidi bou Zid and Kasserine Pass taught the Americans more than all the peacetime theorizing of the past 20 years. Their mistakes included dispersion rather than concentration of forces, poor use of air power, inadequate training and physical conditioning, and poor command and control. All of these issues were to be addressed, and in a hurry. Meanwhile, the Germans came to several wrong conclusions about their new enemy. Their biggest mistake would be to think of the Americans as poor fighters. It was a judgment that would stand the Americans in good stead for the rest of the war: it is good to have an enemy underestimate you and under-prepare for you. As for the Americans, their respect for the Germans did not give way to an inordinate fear of them. Instead, stateside training was beefed up, and tactics and doctrine were updated to meet the realities of the war at hand. And the II Corps got a new commander, George S. Patton, who made more than a few changes. Brian John Murphy writes frequently for America in WWII and other history publications. This article originally appeared in the April 2006 issue of America in WWII. Order a copy of this issue now. Photos, top to bottom: German Field Marshal Erwin Rommel; US antitank weapons destroyed this German Mark III near Kasserine Pass in Tunisia in early 1943; American tank crews bound for Africa practice operating Shermans in the California desert; soldiers of the US 16th Infantry march through Kasserine Pass; Italian prisoners of war march from the stockade to a transport train in Tunisia after the Battle of Kasserine Pass.